Flicking through Andy Ricker’s The Drinking Food of Thailand, I was immediately and naturally drawn to the recipe for Isaan fermented pork-and-rice sausages, one of my favourite Thai foods. Is there any chance I would make these at home? Pretty much no. I don’t have a sausage maker, nor a sausage funnel. But when it comes to being pleased at holding this hot little 2017-published recipe book in my hand, does it matter? No. I’m one of those subsets of cookbook readers who are quite happy to scour the recipe simply for interest’s sake and to be transported to the streets of Thailand for a few moments in my mind, back to a time when I was able to buy and tuck into some sausages on the streets of somewhere in Isaan in person. In fact, every time I’ve seen this book sitting on my desk or coffee table over the past week, I’ve craved a damn fermented sausage. Maybe I’ll have to make the recipe after all. The Drinking Food of Thailand is a beautiful book to simply hold and read, from the hard-to-keep-your-hands-off cover to the design, typesetting and no-fuss, retro-style photos taken by (Travelfish friend) Austin Bush and Adam Levey. 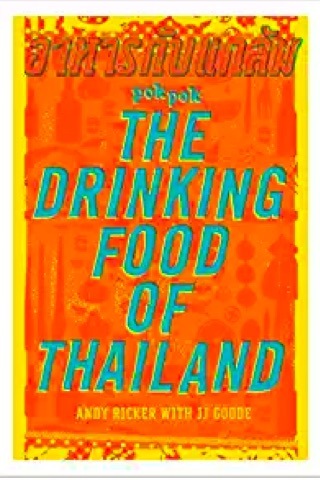 Ricker is a chef who runs the restaurant Pok Pok and Whiskey Soda Lounge in the United States, and he’s spent a long time in Thailand; it’s clear from the level of detail in this book and the many tales it contains that he knows his stuff. And like David Thompson’s stunning and encylopaedic Thai Street Food, this book is much more than a recipe book, with plenty of colourful anecdoates embroidered within its pages. We begin with Ricker’s time in Thailand in the mid-1980s, back when the way to get to Ko Tao was to catch a fishing boat filled with coconuts, and his introduction to aahaan kap klaem or Thailand’s “drinking food”. So what is the drinking food of Thailand? While there’s no hard and fast definition, Ricker writes, drinking foods are the roster of dishes that he’s seen “again and again at the bars, karaoke joints, dance halls, cabarets and other watering holes in Thailand over the past two decades… Often insistently spicy, salty, chewy and/or sour, they’re meant to keep you drinking, to keep the night going”. Each recipe in the book kicks off with a little interesting preamble giving background to the dish. While Thompson’s book is rather encyclopaedic, Ricker’s is more a record of the foods he’s eaten and then cooked himself over the years, with a focus on the North simply because that’s where he’s travelled the most extensively. Specifically the book is divided into snacks, soups, dips, fried foods, grills foods, salads, stir-fries, late night and morning food, plus sundry items, a certainly sensible arrangement. Think recipes like Northern Thai frog soup, Isaan sour soup with pork, fried minced pork patties, fried pig ears, pork cracklings, Isaan beef and liver sausage, pig brains grilled in banana leaf, squid salad, pork soup with steamed blood cakes and offal—so not really a book for vegetarians (and obviously the title gives away that this isn’t a recipe book suited to throwing elegant dinner parties). Ricker also covers more in depth food-related stuff like lao khao (normal rice whiskey and the herbal variety), grilled dried cuttlefish, beer, the Thai style of grilling, and whiskey soda. The book is written with an American audience in mind, with tips on how to find more obscure ingredients there rather than anywhere else, and also a bit of an “in the States you can eat this…” vibe, but as long as you know this isn’t the book to tell you where to pick up a particular sauce in Sydney or London, it shouldn’t detract from it too much. Bonus: There’s an index. I can’t speak yet for whether Ricker’s recipes are actually going to work in your kitchen (see lack of sausage maker above). But will you be enticed to cook these recipes? Yes! We love that the ingredients are given with great precision—that is, in grams, and not for instance cloves, or pieces, or whatever other imprecise measurement you’ll often find in other recipe books. Some recipes feature a rather daunting sounding “Special equipment” list but usually the items featured here are not too special—I have a mortar and pestle, a rice cooker, plenty of cheese cloth and a deep-fry thermometer, though a charcoal grill is pushing it, as is a burr grinder (okay, I don’t even know what that is). Even if you don’t plan to whip up the recipes (honestly, we don’t cook Thai food at home because nothing, nothing compares to the real thing we reckon, so why even bother?! ), this book is a wonderful souvenir of a trip to Thailand, or a great post-trip treat. Just try absorbing yourself in it for an hour and NOT booking the next available flight to Bangkok. Your rice whiskey is waiting, as are these dishes.